Base: 5" x 5" Height: 11.5" (with handle) Diameter: 10"
The Basket Maker's Catalog is again privileged to teach a group of Allen County Kentucky 4-Hers. This summer's 4-H Basket Project is the Williamsburg Basket, made with a medium-sized Williamsburg 'D' Handle; it's accented with 3 rows of green (the official 4-H color). To find out more about 4-H, a community of 6 million young people across America learning leadership, citizenship and life skills, visit www.4-h.org (opens in new window). Calculate Supplies for 1 to 20 4-H Williamsburg Baskets with the Basket Supply Calculator. The Supply List gives you the least expensive way to purchase the supplies for your quantity of baskets. View on-line or print to your printer. When the pattern calls for soaking your flat reed, soaking 1 or 2 minutes in warm water is usually long enough to make reed flexible; seagrass needs only to be spritzed. Soak the Flat Oval Reed for 5 to 10 minutes in hot water. If reed becomes dry while you are weaving, dip it in water for a few seconds. Soak natural reed and dyed reed in separate containers. Rinse dyed reed well & wipe before using. Flat reed has a smooth side and a rough side. You can determine the rough side by sharply bending a wet piece of reed in half. The rough side will usually fray or splinter more than the smooth side. Keep your weaving even as you make your basket. Leave no space between the rows on the sides. As you weave, gently pull on the stakes, leaning them outward and allowing the basket to open into a round 10" diameter at the top. Using a pencil, mark the inside center of the handle's base length. Cut 9 stakes 24" long from 5/8" Flat Reed (heaviest weight). Soak all the stakes. Mark two stakes in the center on the rough side of the reed with a pencil. Place a twist-tie around the center of another stake and lay this stake rough side up on top of the handle at a 90° angle, aligning the handle mark and twist-tie. NOTE: The twist-tie identifies the center of the base. All stakes will be woven rough side up and placed about 3/8" apart. Place one marked stake to each side of the twist-tied stake, hiding the center marks under the handle. Next, weave 1 stake on each side of the handle--parallel to the handle--weaving over the center stake and under the other 2 stakes. Adjust these stakes so they are centered with 3/8" space between. See Photo 1. Weave another stake parallel to each side of the handle. The two final stakes continue the alternating over one, under one pattern and are woven across the handle's base. Adjust base to measure 5" x 5" and secure corners of base with clothespins. See Photo 2. Stakes will extend about 9.5" from the edge of the base on all sides. Rewet the stakes at the perimeter of the base and upset the basket by creasing each stake upward. Use the most flexible weaver you can find for the first 2 rows of weaving. 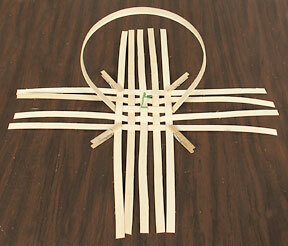 Push the stakes outward while weaving the first 2 rows; you are working toward an open / rounded shape. Pull stakes outward as you weave to create the "Williamsburg" shape. Overlap the beginning and ending of each row across 4 stakes. Weave the sides in plain weave (rough side to the inside) as shown to the left. Soak or spray stakes that extend above the top row. Pack rows. Crease, trim to length, then tuck each stake where the top 3/8" row of weaver is on the inside of the basket. 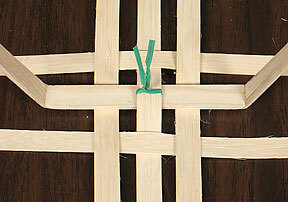 Hide each tucked end behind a row of 5/8" Flat Reed on the inside of your basket. Cut all remaining stakes flush with the top of the basket. Sand the 1/2" Flat Oval if desired, then soak. Determine the rim lengths, allowing about a 4" overlap. Mark and carve the overlap. Attach rims and #3 Seagrass rim filler to the basket with cable ties. 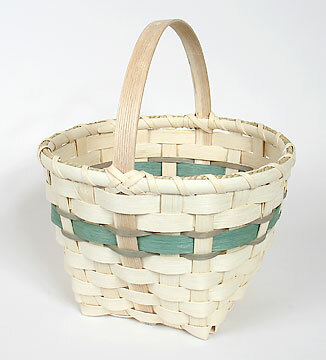 Using 1/4" Flat Reed, single lash the rims to the basket (creating an interwoven backstitch at the handles if desired). See photo of completed basket. Sand the handle. Sign and date your basket. Enjoy!